She's been doing this all week. I have an important scientific finding to report, regarding a newly observed heritable trait. The pillow is the noteworthy thing in this picture, not the flappy hand. Although, now that you mention it, that too. Towels, as everyone knows, are almost as helpful to sorting out bugs in your code as pillows are. God, these are terrible photos. What's this? Some sort of textile object, I perceive. Just a moment for adjustments, and... ah! Steve needs to step up his game. Sessile head-thinging is a head thing of the past! Head things on the move are the way of the future. It's raining, while Rome burns. It rains and rains, and nothing drains. Crossing the street is an exciting adventure in fording streams. It is damp even inside the clothes dryer and my hair is retaining water like a pre-menstrual victim of congestive heart failure. First world dilemmas, how embarrassing you are. For instance, I wear the same shoes--boots, actually--nineteen days out of twenty. They are quite wet at the moment. They were aggressively expensive, but considering the use I have gotten out of them I am not too ashamed about it. Then this week I started thinking with alarm about the eventual day they wear out, not to mention the fact that wearing them daily puts greater wear on them than giving them a day between wearings would do. The future looms, cold and bootless. Obvious solution: buy a second pair of related but different boots from the same maker, if you like them so much. And yet the prospect of spending nigh on (oh I can't actually quite bring myself to say it, after all) for no real pressing reason seems not entirely prudent or frugal, somehow. Yet is it not less frugal to wear my existing boots into the ground like a horse that is never rested nor watered? This in fact goes well beyond being a mere first world dilemma into the realm of moneyed-idiot pseudo dilemma, a whole super-class of moronic "problem" best solved with a quick slash of the guillotine. I do hanker after those boots, though. No matter. It is easy for me to deny myself in this case, quite aside from the sway of my bank balance and common decency, because I am far too incompetent to deserve any treats at all. Today's major achievements have been making vast quantities of horribly mediocre tofu curry (you may wonder how mediocrity, by its nature, can be horrible, but I assure you it was), somehow giving myself an itchy face rash in the course of trying to make my skin look nice, failing to take a shower, and tramping mud all over the kitchen and laundry room floor. There's a hand towel bungeed to our coffee table. I got paid! My bank account is now looking almost unwholesomely healthy. You'll be pleased to learn that I immediately responded by purchasing the expensive lipstick I had been contemplating. Then I made some food for the baby, to demonstrate concretely that I could both have lipstick and feed my own child. Well done me. 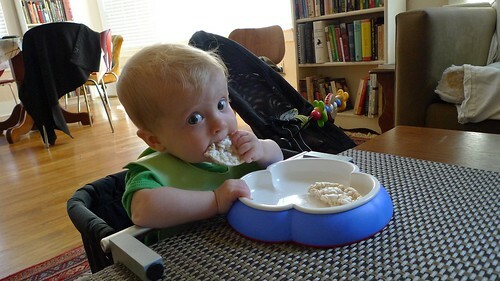 It turns out that I am the kind of person, at least right now, who really enjoys making tiny baby delicacies. This will probably surprise exactly no one who knows me, since it combines my abiding interests in cooking, geeking out over cooking (as I used to do with bread baking), and avoiding slimy half-eaten purees. There is no way, obviously, to pass entirely over the fact that infant eating is a messy process, especially if you are also attracted by the difficult to reconcile ideals of letting them feed themselves and of not being a fussy control freak, but I do my best and have been channeling my overly fastidious impulses into cunning little vegetable patties. I may as well enjoy it while I can. You also may be interested to know that organic brown rice ricecakes are for the birds. They are nasty hard things that get sticky and useless in five seconds flat. Their store brand white rice counterparts are more like it. Meanwhile, Halloween is nigh upon us and so today I was in a position to say, "This bag is filled with koala components." And say it I did. If it comes out at all successfully, I will be sure to post photos, never fear. I suppose we had also better remember to buy a few sacks of candy to dispense to the local small costumed people. I hope there will be plenty of them. It is so disappointing when trick or treating comprises a mere trickle of desultorily dressed youths whose parents are sitting in idling cars nearby. On the other hand, Halloween is by all reports a thing here, and by "thing" I believe I mean the kind of drunken, fratty revelry that one would prefer to flee town altogether in order to avoid, not unlike St. Patrick's Day in Chicago. Once we accidentally went to Chicago on St. Patrick's Day, and as visitors we didn't even have our own home out of the way of things to escape to. I won't forget that sea of bobbing boozy giant green foam top hats in a hurry. I'm not entirely sure what the Halloween equivalent of the giant green hat is, but I guess I'll find out. This photo spread of "Dogs Looking Depressed in Their Halloween Costumes" is a good idea, but ultimately I'm not convinced. None of the dogs looks as glum as the captions claim. By contrast, pretty much almost every photo ever taken of a cat would fit right in at mycathatesyou.com. What this proves about cats and dogs is left as an exercise for the reader. Don't you just wish you were married to me? Me: Sometime we should go out on a date that requires real dressing up, in the sense of you wearing a suit. Or doesn't require it, but includes it. Plus dzing. Steve: Oh, Dzing! Not "Dee Zee-ing". Steve: I was like... "Demilitarized Zoning"? Me: That would be "dmzing". Me: Which smells like napalm. We occasionally have the old-fashioned kind of conversation, too. On this occasion, I am clanking about in the kitchen: "What's 200 degrees Celsius in Fahrenheit?" "About 400." (hem, hem.) "392, specifically. You can figure it out exactly, because it's 1.8 times 200, plus 32. It's super easy to go in that direction. Harder going the other way." "What? How am I supposed to remember 1.8?" "Well, boiling is 100, compared to 212 in Farenheit. So you just offset by 32 degrees because of freezing, and—"
(Psh.) "'Fahrenheit is really great; multiply by 1.8.'" Thank you for all the suggestions. I will take them up in good time. Just now Steve has gone out of town to find us a place to inhabit next year, so for the moment all I will be making is myself slightly insane, plus the usual thousand mats a day of post-partum shed hair. Do you need some to fill your hassocks with? I have plenty and am not feeling stingy. So in the meantime it is just me and Jane and the entire last season of Lost. The bottom layer is the mock shearling blanket mentioned here. It showcases wool's talent at being fluffy and insulating. On top of that is a tightly woven and super-lanolinized wool mat that I bought off the internet. It demonstrates wool's ability to repel water, or more relevantly, baby piss. To soak up that which has been repelled we have a lovely cheap hand towel, showing off cotton's aptitude for absorbency, laundering, and cheapness. The structure as a whole highlights my champion skills at being a dork. QED. I am also fond of my Bensimon tennis shoes. They would be fashion forward if it were three years ago. I find them charming, anyhow, and they are some kind of limited edition in linen. Have I convinced you yet that this is an aspirational lifestyle blog? Demonstrated ability to thread said sewing machine, change its foot and needle, wind a bobbin, and sew a seam. Not much else. Oh, a washer, a dryer, and an iron, I suppose. But no fabric, say, or patterns or experience. A scattering of infant naptimes. The internet and a credit card. Tell me, friends, what should I make, and out of what ingredients?